Animated Film Reviews: Cloudy with a Chance of Meatballs 2 (2013): Foodimals on the Loose! Cloudy with a Chance of Meatballs 2 (2013): Foodimals on the Loose! 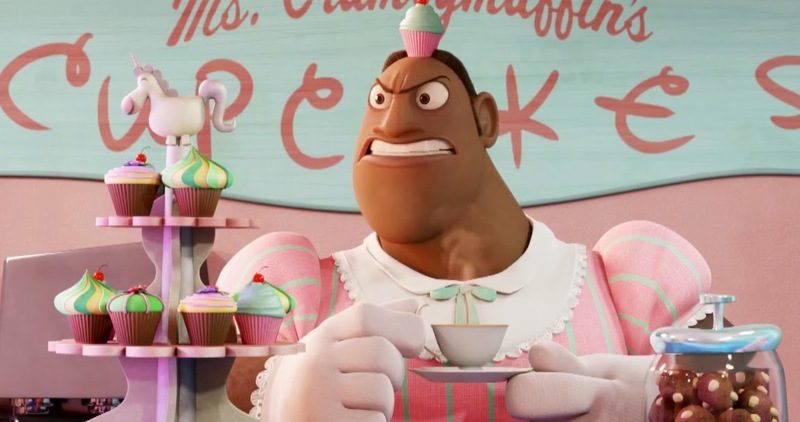 Embrace the Colorful New World of "Cloudy with a Chance of Meatballs 2"
When you have a good film formula, you don't want to tamper with it too much. Audiences buying tickets to a sequel already know what to expect when they come in to see your product, and it's not a good idea to disappoint them. 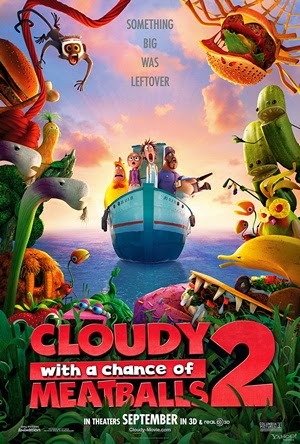 "Cloudy with a Chance of Meatballs 2" (2013), directed by Cody Cameron and Kris Pearn from a screenplay by John Francis Daley, Jonathan Goldstein and Erica Rivinoja, certainly does not disappoint, though it doesn't really satisfy completely, either. While the authors of the original source material, Judi and Ron Barrett, went off in a completely different direction with their own follow-up, "Pickles to Pittsburgh," that is not what Sony Pictures Animation, the producers of "Cloudy with a Chance of Meatballs 2," had in mind. They play it safe, simply following up the first film and repeating the same format which worked so well. The changes basically are only those essential for continuity and adaptations from the first film to make this one smoother and more audience-friendly. That should satisfy the many viewers of the first film, though it also means the follow-up isn't as clever or inventive as the original "Cloudy with a Chance of Meatballs." 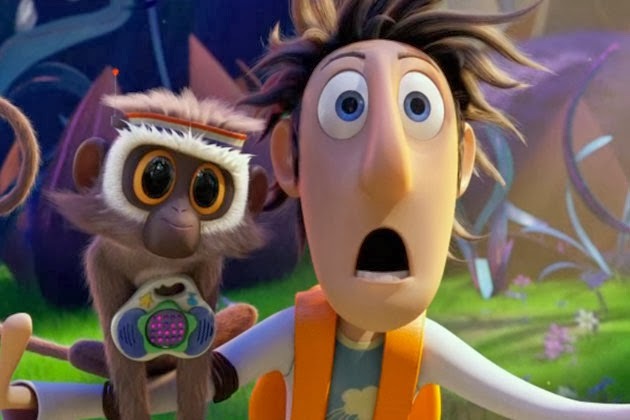 Flint Lockwood, having in the original "Cloudy with a Chance of Meatballs" after great effort shut down the "Flint Lockwood Diatonic Super Mutating Dynamic Food Replicator" (or "FLDSMDFR" for short), which went crazy and produced too much food, now works at Live Corp Company in San Franjose. The entire town of Swallow Falls, in fact, has had to move there (it's a bit unclear why they all wound up in the same place) while crews from Live Corp clean up its Atlantic island. Live Corp is a kind of think tank, full of scientists and inventors who work tirelessly to make the world a better place "for the betterment of mankind." It is run by the world-famous and eccentric Chester V, who is aided by Barb, Chester's orangutan assistant. Tim Lockwood, Flint's dad, is trying to get to know his son better, while Sam Sparks, the TV weathercaster, is still in love with Flint. Manny is Sam's cameraman, while Brent McHale is now the owner of a chain of Chick-N-Sushi restaurants. Flint's pet Vervet monkey, Steve the Monkey, is still around communicating by using the Speak and Spell thought translator that Flint invented. Steve tends to cause a lot of mischief while constantly reminding Flint that he's hungry. Chester V, as you might imagine, has ulterior motives for hiring Flint. Take one look at his Live Corp campus, full of high-tech glass office buildings and neutral tones that contrast completely with the utterly normal and prosaic Swallow Falls, and you know that Flint and his crew are out of their element. It turns out that Chester in fact is not quite the benevolent despot that he, with his corporation's avowed intent to simply help people, pretends to be. "Oh no, it's a strawberry!" In fact, Chester's team isn't really there to clean up Swallow Falls at all. Instead, they want to fix the FLDSMDFR so that Chester can use it to buy up what little of the world he doesn't already own. Flint returns to Swallow Falls and finds that the FLDSMDFR hasn't just been fixed, but it has gone crazy and now is churning out whole new life forms, or "Foodimals." 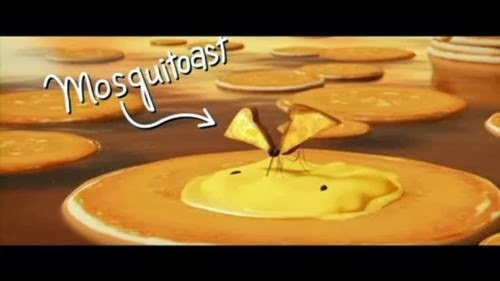 There are cheeseburger bullies that run around on spider legs composed of French Fries, lettuce-spitting taco-dile supremes, bananostriches, PB & jellyfish, melonheads, shrimpanzees, moquitoasts, watermelophants, applie-pie-thons, and, in fact, 39 different new species of foodimals which inhabit mountains, rivers, swamps and jungles all created by the FLDSMDFR. It's very scary in a way, but the foodimals turn out to be inoffensive, even friendly. Chester, though, ultimately wants the foodimals to leave the island and inhabit the rest of the world. Flint and his crew once again, after various stops and starts, must figure out a way to shut down the FLDSMDFR before its creations invade the entire planet. 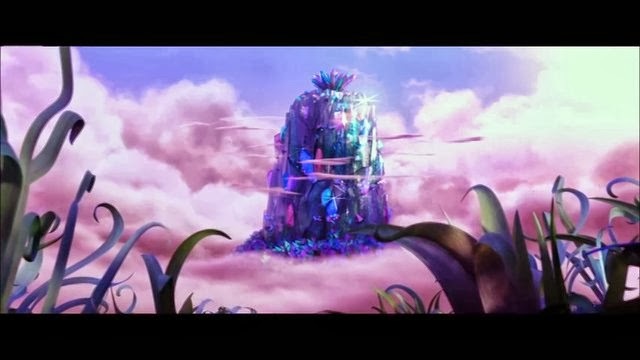 The animation really is superb in "Cloudy with a Chance of Meatballs 2"
The plot of "Cloudy with a Chance of Meatballs 2" isn't any more inventive than was the plot of "Ghostbusters 2" or similar replicas of an original triumph. Once again, Flint's wayward creation is causing problems that only he, it turns out, can solve. 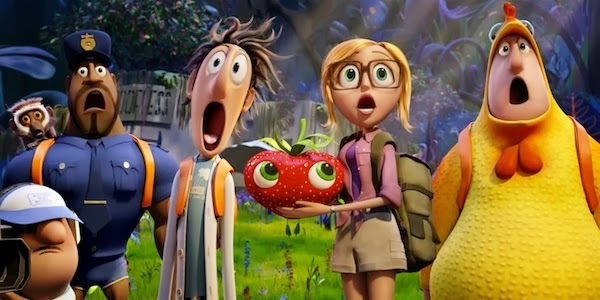 Where "Cloudy with a Chance of Meatballs 2" scores is with its animation and 3-D effects. The script is very clever in a way, because it opens with the sterile, metallic-and-glass dryness of the corporate world, and then juxtaposes that lifeless wasteland with the wildly and shockingly colorful and wacky creations of the FLDSMDFR. The change is a welcome relief, literally and metaphorically taking us on a journey from our own normal, everyday drab world to a wonderland filled with the kinds of crazy and exquisitely detailed alien life forms that show off animation at its best. So, like the saying goes, the people behind "Cloudy with a Chance of Meatballs 2" sell the sizzle, not the steak. The defining characteristic of "Cloudy with a Chance of Meatballs 2" is characters with their mouths wide open in astonishment. There are food puns galore, a zany tone and manic pace, and lots of action. The original "Cloudy with a Chance of Meatballs" took care and time in establishing relationships and characters, but the sequel isn't about that at all. Instead, it is loud, with screaming and running around and an excess of energy that betrays the fact that, aside from the presence of the obligatory evil guy to set in motion essentially the same complication that was at the heart of the first film, nothing new is going on. Those with a historical bent might wind up comparing "Cloudy with a Chance of Meatballs 2" with another zany comedy from an earlier era, "Yellow Submarine." In that earlier film, you have a similar dull, dreary world suddenly replaced by a colorful and crazy animated one. There even is a character whom the Beatles meet in "Yellow Submarine" who is vaguely reminiscent of the foodimals in "Cloudy with a Chance of Meatballs 2." A more direct link between the two films is that former Beatle Paul McCartney, whose single "New" is featured in "Cloudy with a Chance of Meatballs 2," was one of the stars of 1967's "Yellow Submarine." 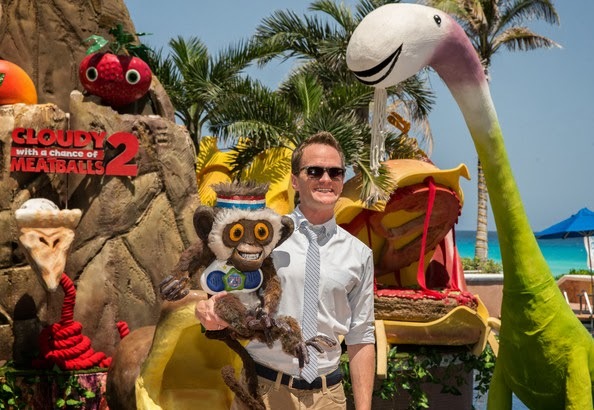 Bill Hader is back as Flint, Anna Faris as Sam, James Caan as Tim, Andy Samberg as Brent, Neil Patrick Harris as Steve, and Benjamin Bratt as Manny. Will Forte, who voiced Joseph Towne in the original, rejoins the proceedings in the new character of Chester V, while Kristen Schaal does what she can with the limited role of Barb. In an interesting twist, at least for animation insiders, the foodimals are voiced by production staffers. Thus, the shrimpanzees are done by director Kris Pearn, Barry the Strawberry is voiced by director Cody Cameron, and so on and so forth. Mark Mothersbaugh composed the music, while young Australian Cody Simpson contributes the song "La Da Dee." Will you enjoy "Cloudy with a Chance of Meatballs 2"? Most likely, because it will be like visiting an old friend that you haven't seen in a while and are glad is doing well. Will you wind up thinking about it weeks or months later, rhapsodizing to your friends about how clever it was and how much you want to see a sequel? Probably not, because you've already seen this before and it is unlikely to change your view of animation or anything. "Cloudy with a Chance of Meatballs 2" is food for the eyes and ears, not for the mind. Now, the best animated films - make that, the best films in general, not just animated - focus on and explore relationships. "Cloudy with a Chance of Meatballs 2" is not about exploring relationships at all, because those were all established and run through in the first film. The sequel simply inserts a generic bad guy who replaces Flint's naivete with guile as a foil for Flint and his cronies to battle, and we've all seen that before. The undemanding younger crowd is probably going to like "Cloudy with a Chance of Meatballs 2" the most. 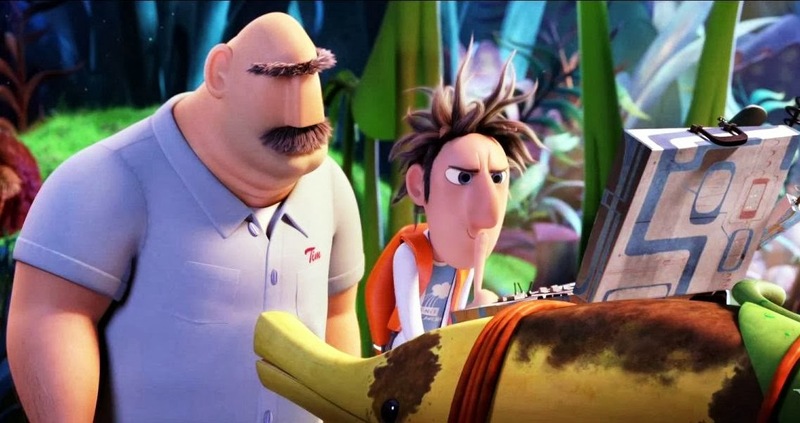 "Cloudy with a Chance of Meatballs 2" will be dynamite, by the way, when played in the Blu-ray player right after the original - who needs that pesky character development anyway? "Cloudy with a Chance of Meatballs 2" is good fun, a great meal that will satisfy your craving for fun animation until the next offering comes along. Below is the US trailer, with the international trailer following.